Beat pudding mixes and milk in large bowl with whisk 2 min. Add lemon zest and juice; mix well. Line bottom of medium glass serving bowl with 1/3 of the cake slices; drizzle with some of the reserved peach syrup. 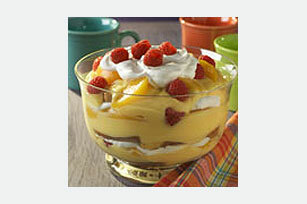 Top with layers of 1/3 each of the pudding, peaches, raspberries and COOL WHIP. Repeat layers twice. Substitute angel food cake for the pound cake.